Nightcrawler offers a chilling portrait of the state and direction of news media. The film doesn’t adopt a cynical or condemning tone or one of outrage towards the state of affairs, it just lays it out there and, whilst it’s at it, it introduces us to a character tailor made for this era of news. At the center of it all is Lou Bloom played masterfully by Jake Gyllenhal in one of this year’s best outings. His character drew me back to Scorsese’s 1982 film The King of Comedy and its central character, Rupert Pupkin. The two characters initially appear reasonable, precise and refined with their incisive speech, persistence and poise which cushions them from the excruciating neglect they face and all that makes you want to root for them as they pursue the American dream. The similarities however end there as Pupkin’s colorful apparel, cheerful demeanor and beaming face is replaced with Lou’s serial killer hollow eyes, gaunt features and artless shirt-trouser combo for apparel. I must say he also emitted a loner vibe akin to another De Niro character, Travis Bickle but I liked Bickle, Lou is just disturbing on a number of levels – he is a sociopath, plain and simple. When we meet him he is hustling his way night by night. We see him early on selling stolen scrap for money. On one of his night time roams, he runs into a camera man played by Bill Paxton filming a vehicular collision (thank you Hot Fuzz). He learns Paxton and his team are freelancers who chase down car wrecks, killings and other unfortunate happenings. They sell the footage to news rooms which offer the most money. This is kind of a “Paul on the road to Damascus” moment as he appears to have found his purpose in life as he too finds himself a camera and gets himself to work on night time LA. Gyellenhaal does a great job portraying this character and though we have no inkling of his characters history we can gather he was born on the other side of the perceived social axiomatic line and is very comfortable residing there. His morbid fascinations and perverse voyeuristic drive make him ideal for this line of work and the media networks are there feed his ambition. He cuts a brazen anti-social figure and the only substantive relationships he forms (which were in themselves creepy and self-serving) are with news room director Nina Romina played by Rene Russo and his assistant/intern, Rick, played by British actor Riz Ahmed. Romina, buys footage from Lou and pushes the journalism ethical barriers in the name ratings and is even almost as forthright with Lou as he is with her and she flat out tells him they prefer crime stories involving white people in affluent neighbor hoods, nobody cares about the poor and the minorities. Lou obliges her by bringing the most shocking and bloodiest videos to the point of navigating active crime scenes and intruding on disasters. Rick, his assistant, is at times the film’s beacon of morality but he is too easily engulfed by the morbid depravity surrounding him as he needs some cash so he is quite submissive to Lou and his qualms, no matter how extreme. I have a crime blog and sometimes smile with glee when there is a grisly murder or a calamity sparking bewilderment but Gyllenhaal constantly pushes his character to dire depths that continue to shock us till the end and the film rides on his performance and the tone it creates. I also felt director Dan Gilroy, in his first feature, does his best to keep us detached from Lou though I did not feel he was necessarily repulsed by our protagonist, not that he had to, he leaves that to us. He also does not make the misstep by dwelling on the fact that we the consumers of the media created the man most of us (I hope) have now come to loath. He captures night time LA successfully, along with his DP (Robert Elswit working with both digital and 35mm) which is key to creating an original noirish atmosphere that some may call a benchmark for future films. We also get that thrilling sequence towards the end leading to the car chase was handled with such craft and verve. His media and social satire is on point as we witness the dark side of shameless news gathering and the fabled American dream and like The Wolf of Wall Street, there are tons of quotable lines. 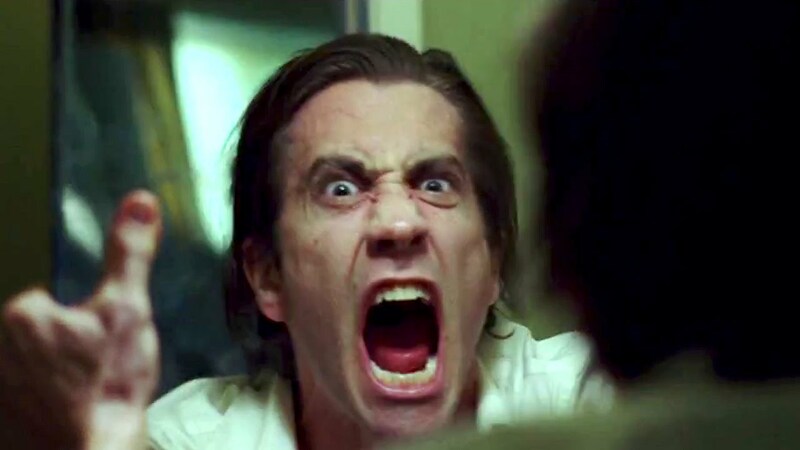 Nightcrawler plays as a chilling black comedy with an exclamation point akin to Friedkin’s Killer Joe. Gyllenhaal’s exceptional turn should not detract from the superb and thrilling storytelling from a first time director and the performance of the supporting duo, Russo and Ahmed, who are really good here. It is frighteningly real and unapologetic, tastefully creepy and a relevant portrait of media today.